Your Blood Lipid Profile is often mentioned when you have a routine physical or when you are undergoing blood tests for diagnostic purposes. Lipid is another word for fat and a lipid profile tells you the concentration of various types of fats in your blood. These include triglycerides, cholesterol and their protein transporters, VLDL, HDL and LDL. Most of the fat in your diet is in the form of triglycerides. It is also the storage form of fat in your body and the form that circulates in your blood. For all of you chemistry buffs, triglycerides are made up of a molecule of glycerol with three fatty acids attached. Hence the name tri (3 fatty acids) glyceride (glycerol attached). Although, triglycerides are the most common fats, it is safe to say that the sterols, particularly cholesterol, are the most notorious. These organic compounds have a different structure than the triglycerides and therefore, function in a different way in the body. The body can produce them or they can come from the foods you eat. Although they have gotten a lot of bad press, sterols, including cholesterol are necessary for good health. It is when cholesterol collects in the arteries that it becomes the bad guy—potentially leading to heart attacks and strokes. It is important to note that the dietary factor most affecting your cholesterol level is the amount of saturated fat you eat and not the amount of cholesterol in your food. What is a desirable blood lipid profile? Keep in mind that these values don't tell the entire story regarding your blood lipid profile. Your body chemistry is much more complicated than can be defined by four numbers. They are a good place to start, but the research in ongoing as to the actual correlation between these numbers and your health. For instance, the test for LDL cholesterol measures one parameter with regard to these low-density lipoproteins, but a different test, which is not routinely done, could reveal a more useful indicator of the risk of cardiovascular disease. There is also some controversy about total cholesterol numbers and what is the optimum level, especially as you grow older. Interesting Fact for Blood Lipid Profile: People often confuse the cholesterol found in food with the cholesterol found in the blood that produces that overall number (Oh no! My cholesterol is over 300!) 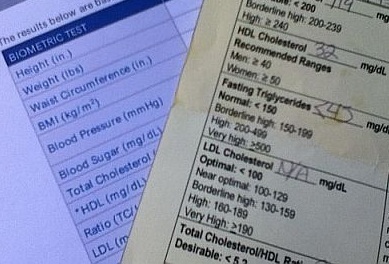 and the so-called good cholesterol (HDL)/bad cholesterol (LDL) numbers. That good and bad cholesterol is not found in food, but rather refer to lipoproteins that circulate in the blood as fat transporters. What is the value of knowing your fat numbers? Most health experts agree that consistently elevated blood lipids increase your chance of developing heart disease and high blood pressure. Knowing your blood lipid numbers will encourage you to evaluate your diet and lifestyle and may motivate you to eat healthier. If your numbers are good, it may help you to keep doing what you're doing to be healthy. Click here to go from Blood Lipid Profile page to Fats page.